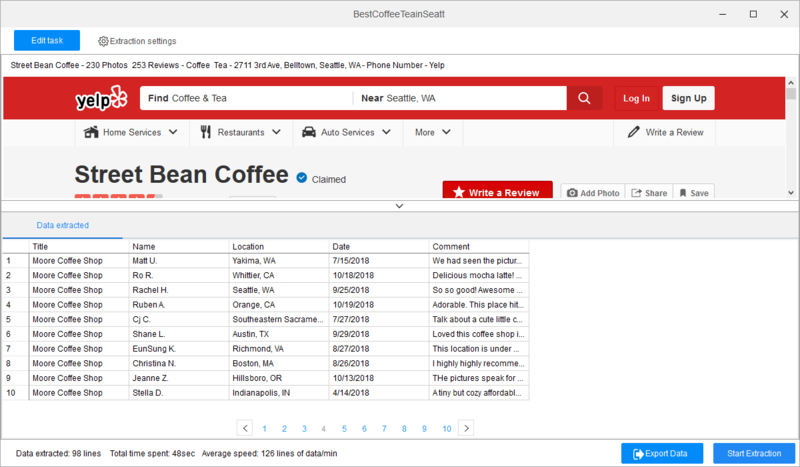 In this tutorial, we are going to introduce how to scrape Yelp review data. We will enter the detail page of each coffee shop, scraping the shop name, the reviewer's name and the comment. As this website employs AJAX technique to load the new content, we need to set up "AJAX load" to help Octoparse avoid being stuck. · Check "AJAX Load" and set up "AJAX Timeout"
· Click "Select All" on the "Action Tips"
Now, let's build a "loop item" to have all reviews captured. Octoparse will intelligently identify all the comment sections on the page based on the pattern you've just defined. · Click "Extract text of the selected elements"
A "Loop Item" will be automatically generated and added to the workflow. By default, Octoparse automatically extracts from the item selected, however, if this is not exactly what you are looking for, you can delete it and add the data fields you need as below. · Click "extract text of the selected element"
In this case, the cafe names are not always located in the same place on different detail pages. So to avoid data missing raised by this irregular location issue, we need to modify XPath in Octoparse to ensure the element on each page to be precisely detected. Was this article helpful? Contact us anytime if you need our help.